Historically, the steady growth of our Workers’ Compensation industry has been curated from trust, compassion and networking. As digital transformation occurs globally, our industry is embracing data and its value like never before. We have many opportunities within our system to move forward by transforming data into insights which can be used to protect our injured workers and improve outcomes. I say let’s keep innovating and accept that data will be our currency. We are often asked to build a story from the vast amounts of data collected in the Workers’ Compensation pharmacy process. And there are a lot of stories to tell! Sometimes our discoveries are in plain sight. For example, clinicians may only need to look at a simple report containing a few medications to discover an issue that could adversely affect the therapy regimen of a patient. At other times, finding those adverse utilization patterns require a more analytical approach. That’s because we not only want to know when those adverse patterns are occurring but also the magnitude and duration as well as many other key metrics. Those insights provide us the assurance to apply the most sensible therapy. One way to provide those insights is to employ modern data visualization techniques. This is not a new topic. However, in recent years, there have been several new applications introduced that dramatically enhance how we both produce and consume data visually. These aren’t hard to locate, just use your favorite search engine to find “top data visualization tools”. The analytics market is booming and data visualization is leading the way. Regardless of the tools we use, the goal of any data visualization is the same: communicate information. Analytics is often described as a discipline that enables the transformation of data into information. When done correctly, data visualization is how information is communicated in an intuitive way. There’s no “one size fits all” in the data visualization world. There are many tools, techniques and of course many sentiments of the data consumer. But along the way, we find a few techniques that work better than others. I’d like to share a few data visualization techniques that have worked when communicating injured workers’ pharmacy utilization. As you can see from the chart, the overlapping drug utilizations and magnitudes are in clear view. The graphical representation of each drug’s utilization is represented by the size of the bars with a numerical reference to the number of days overlapped. What makes this chart so helpful is that it eliminates the need for the user to calculate and then represent magnitude of the overlapping utilization. The user only needs to look at the chart to immediately recognize that on the 28th of February, concurrent use of these drugs began and lasted for 22 days. This makes for a much faster interpretation of the underlying data. Furthermore, this visualization technique can be applied to other combinations of drug utilization. We often look for outliers in a large population of patients. We may be looking for patients with the largest aggregated morphine equivalent dose (MED), high opioid utilization, most number of prescribers and so on. It’s very common to rank patients based on any one of those measures top to bottom. However, additional complexity is introduced when we want to rank patients on more than one metric. For example, what if we want to rank patients on opioid utilization and prescriber count? A popular approach is to use a scatter plot chart. Scatterplot charts are great at illustrating a correlation between two measurements. 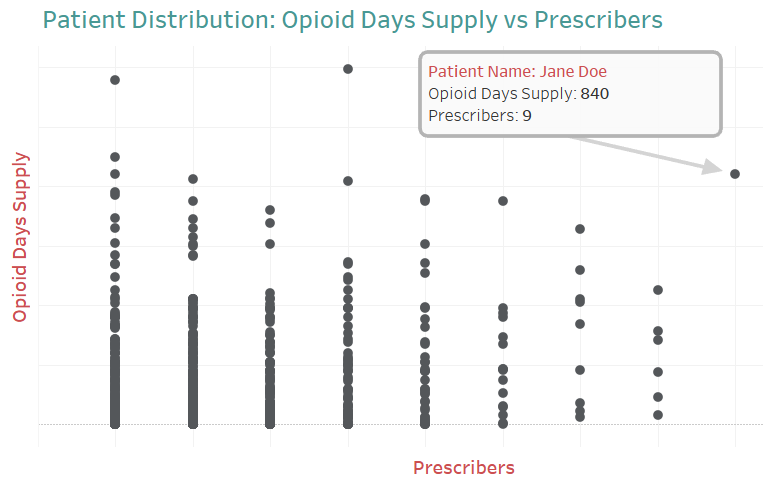 In this case, we can view an entire population of patients and how they rank by opioid use (measured in days supplied) and number of prescribers. The interpretation is simple: the dots plotted higher (vertically) on the chart are those patients with the highest opioid utilization. The dots positioned to the right (horizontally) have more prescribers. The outliers here may be the patients exhibit both traits as highlighted above. This becomes a valuable tool when locating members of a large group that may require intervention. In this example, we can easily see what utilization pattern changed over time because the measures are colored red when an increase occurred, green when a decline occurred and grey when no change was observed. We also can “stack” various units of measure neatly into one single view. It’s a simple way to communicate several data points. As we look to the future, data visualization solutions will continue to evolve, providing us the ability to shape, communicate and consume data faster than ever before. In recent years, we have seen an explosion of tools and techniques that have empowered nearly every role within an organization with the ability to communicate data visually. And as we elevate the value of data, the demand for data interpretation will grow accordingly. Finally, in our business domain, as we continue to drive positive outcomes for injured workers, will can leverage data visualizations to tell the story hidden in our data. Cliff Belliveau is the Vice President of Business Intelligence for myMatrixx where he leads initiatives that deliver advanced data analytics. Cliff is an accomplished information technology leader with a track record of delivering solutions to complex business problems. 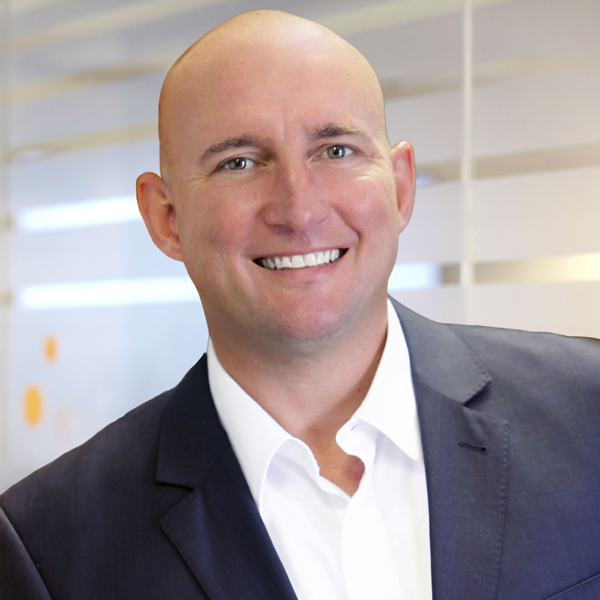 He has over twenty years of experience in several areas of technology including building high performance teams, systems architecture, data integration, software development, operations and support. Previously, he was the Senior Director of Business Intelligence at Syniverse Technologies where he led the development of the company’s first enterprise BI practice. He also led the development of solutions in the areas of ERP, CRM, Billing and business process automation. A lifelong resident of Tampa, Cliff is also a member of the Tampa Bay Technology Forum and volunteers with their foundation, TechStart, that encourages youth to pursue technology careers. He earned his BS in Computer Science and Mathematics from Valparaiso University.